As a result of the 173 scheduled exchange experiences (224 p/m), ideas for joint collaboration will appear into mutually supported research themes, sharing and transferring science and technology within the selected areas. Further development will be based on exchange of know-how and experience between partners, which will be promoted between the research centres in EU and those of the LA region through trans-national two-way secondments (reassignment) of research staff. In order to efficiently transfer the acquired knowledge through the framework of the project, an initial kick off meeting (M1) will be held in order to finally establish the agreed scheduled exchanges. During the programmed exchanges, the participants will be involved in five types of activities for knowledge transfer such as case studies, training courses, short courses, seminars and open days. These activities will let to disseminate the activities of the project such as the socioeconomically analyses, the identification of non-interventionist field studies (on conservation of natural and/or historic sites, biota, environment, etc.) and finally, highlight the intrinsic values of selected sites capable of generating economic activities that allow the sustainable development of the local population. A more detailed description of the cited activities is given in the table below, chronologically ordered. The scheduled exchange comprises 224 p/m (173 exchanges), 106 p/m EU to LA (47%) and 118 p/m LA to EU (53%). 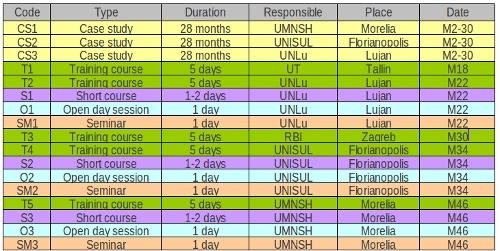 UAB 51 p/m (23%): 14 p/m to UNLU, 5 p/m to UNISUL, 6 p/m to ADRAM, 26 p/m to UMSNH. UT 33 p/m (15%): 12 p/m to UNLU, 9 p/m to UNISUL, 1 p/m to ADRAM, 11 p/m to UMSNH. RBI 22 p/m (10%): 5 p/m to UNLU, 6 p/m to UNISUL, 6 p/m to ADRAM, 5 p/m to UMSNH.